The amount of time children spend watching digital screens is worrying. Children don’t seem to get tired of watching TV or playing with the iPad. This obsession with gadgets is a matter of concern, but the immediate worry is about its adverse impact on their vision. Kids use gadgets for playing games, chatting, browsing or watching movies. The activity is usually so involving that they don’t take their attention off the screen. They also don’t pay attention to things like posture, screen distance, and brightness, which can adversely affect their vision and health. Staring at electronic screens for extended periods causes discomfort. You suffer from dry eyes, eye irritation and find it difficult to focus for a while. Spending too much time in one posture can also result in neck and back ache. If you are finding it difficult to cope with screen time, imagine what your child’s eyes must be going through. Digital screens have become an inseparable part of life. You can’t wish them away or keep kids away from them, but you can minimize their impact on your children. The first step is to understand what you are up against. According to the U.S. Centers for Disease Control and Prevention, an average child spends about 8 hours a day watching electronic screens. Gadget use among kids increases with age. Although it cannot be said with certainty, research indicates that children spending too much time staring at screens are at higher risk of long-term vision problems. Apart from televisions and video games, most gadgets came in the last two decades. While the immediate effects on children can be observed, their long-term effects are unknown. According to researchers, children who spend a lot of time with gadgets are likely to develop temporary myopia (nearsightedness). Fortunately, the effect is transient and the eyes recover a few minutes after they switch to a non-screen activity. The effect of spending a lot of time watching screens is not limited to the eyes alone. Apart from symptoms like dry eyes, burning sensation, double vision and blurry vision, people also complain of headaches and posture-related problems like neck and back pain. Doctors now call this set of symptoms as “computer vision syndrome”. When people use electronic screens, they blink less. On an average, a person blinks about 15 times in a minute. Due to the high attention required while using an electronic screen, this rate can drop to less than 5 times in a minute. Blinking is a natural mechanism that keeps the eyes moist, lubricated and clean. A lower blink rate causes dry eyes and irritation. The severity varies according to the type of activity and the level of engagement. A video game, therefore, creates more eyestrain because you have to constantly watch and respond to what is happening on screen. Desktop computers and wall-mounted televisions can make it worse because they make you look upwards. This makes you open your eyes wider and expose more surface area of the eye to evaporation. Electronic screens can generate images with a lot of brightness and contrast and they can vary these images in a fraction of a second. They also reflect glare from surrounding light sources like lamps and windows. Your eyes have to frequently respond to changing light levels. Watching a screen that is too dim or bright compared to the surroundings also causes eye strain. Your eyes have to adjust when you switch from the screen to the surroundings. The frequent dilation and contraction of pupils results in eye fatigue. Most modern gadgets come with LED screens because they produce clearer pictures and consume less power. The amount of blue light emitted by these screens is a matter of concern. LED screens emit a lot more blue light compared to LCD screens. Although research is limited, many optometrists suspect that blue light can cause irreversible damage to the retina. This can increase the risk of macular degeneration and cataract. The macula is the central part of the retina and is crucial to good vision. Macular degeneration can make daily activities like reading and driving impossible. With age, the lenses of the eyes start to yellow. For adults, this provides a limited natural defense against blue light, but children are vulnerable. Blue light can also interfere with the biological clock and affect sleep. If your child complains of burning eyes, you must review the amount of time they are spending with gadgets. Here are some tips that will help. Limit the amount of time your children spend watching TV. Limit other gadget time to an hour a day for small children and two hours a day for school going children. Break this allowance into two or three sessions to reduce eye strain. Gadgets encourage sedentary habits which are bad for the body and mind. Encourage children to spend some time outdoors for activities that require them to move about and interact with other children. Playing outdoors with the dog or other kids is more fun than watching an animation movie for the umpteenth time. Spending time outdoors also exercises long distance vision and reduces the chances of myopia. Keeping your children busy with gadgets or TV may allow you to do whatever you want in peace, but it’s a bad idea. Instead, keep them occupied with healthier alternatives like creative toys, coloring books or storybooks. Children should sleep for about 10 hours a day. Sleep allows the eyes to recover from strain. Ask them to take regular breaks and blink often. While using a computer or other personal device, the eye should be at least 20 inches away from the screen. Don’t let children sit too close while watching TV. If your child prefers to sit close to the screen, get his or her eyes tested to rule out myopia. Kids may not pay attention to lighting conditions when they are engrossed in an activity. Discourage the use of gadgets in a dark room or in bright sunlight. Screen brightness should not be three times darker or brighter than the surroundings. If the device has an auto-brightness mode, enable it. This automatically adjusts screen brightness according to ambient light. Digital screens cause eyestrain and other related symptoms like vision difficulties and headache. Kids are more vulnerable than adults and spending too much time with gadgets can affect their vision. 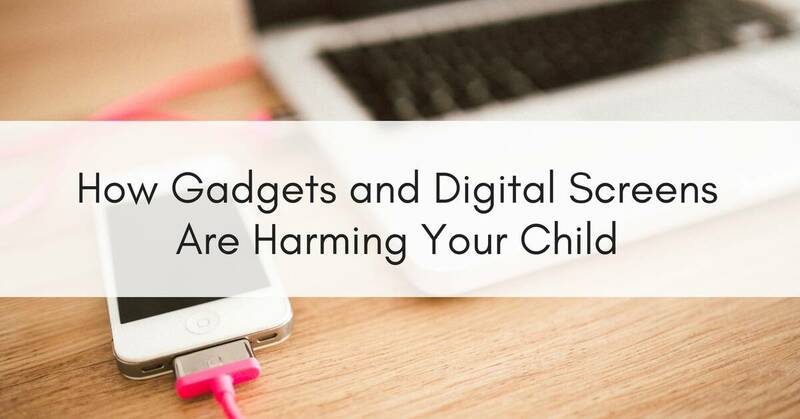 It is difficult to keep children away from gadgets, but you can take steps to minimize the adverse effects.